THIS RUG IS HANDMADE AND ORIGINAL PERSIAN SAROUGH, IN PERFECT CONDITION FOR ITS AGE. ITS WOOL PILE ON COTTON FOUNDATION. MACHINE MADE PERSIAN RUG HAS AN IMPRESSIVE APPEARANCE INDEED, IT HAS A NICE DESIGN WITH A SPLENDID USE OF COLOURS. Mon – Sat 10 am – 6 pm. AGE IN YEARS. THIS RUG IS HANDMADE AND ORIGINAL PERSIAN NAHAAVAND, IN PERFECT CONDITION FOR ITS AGE. ITS WOOL PILE ON COTTON FOUNDATION. Rug is in good condition, replacing only because of renovation. Looks great in front of fireplace, under dining table etc. GBP900 when bought new in Knightsbridge. BEAUTIFUL PERSIAN QASHQAI SMALL CARPET. NOTICE ALSO THE HORSES HEADS,PIC 5,THE THICK PILE,PIC 9 AND THE WONDERFUL SIDE BINDINGS,PIC 10. JUST A BEAUTIFUL QASH'QAI CARPET WITH EVEN FULL PILE. NO LOSSES OR FAULTS. 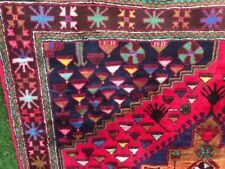 100 % HANDMADE OLD AFGHAN ORIENTAL WOOL ON WOOL ORIENTAL KILIM HAS A SUPERB APPEARANCE WITH A TERRIFIC DESIGN AND NICE USE OF COLOURS. Mon – Sat 10 am – 6 pm. AGE IN YEARS. 100 % HANDMADE OLD KASHMIR SILK ORIENTAL RUNNER HAS A SENSATIONAL APPEARANCE INDEED, IT HAS A DECORATIVE DESIGN WITH A LOVELY USE OF COLOURS. Mon – Sat 10 am – 6 pm. AGE IN YEARS. It is hand made and it is in excellent condition. It is in my view one of the best designs and very well made. My asking price is very well below the price I paid. It is an absolute bargain for the quality and style. TYPE: handknotted, wool pile with wool warp & weft. AGE: modern SIZE: 2.40m x 2.15m - 7ft.10" x 7ft. An amazing, deep pile Moroccan carpet with fascinating symbols on a brick red ground. Unusually, this carpet is almost square. Exemplary Indian Loribaft rug with an exceptionally fine and lustrous woollen pile in a contemporary design. TYPE: handknotted, wool pile with cotton warp & weft. AGE: Modern. SIZE: 1.83m x 1.31m - 6ft. 234x159cm 7'11"x5'4". 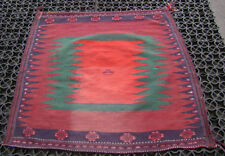 Very Nice Wool Piles Vegetable dye Hand Made Afghan Oriental Rug. An Old Traditional Hand Made Afghan. Origin Afghan. Province North Afghan. The Rug is not perfectly rectangular or evenly straight due to being handmade. 100 % HAND WOVEN OLD MASHAD KHORASON PERSIAN CARPET HAS A MARVELLOUS APPEARANCE INDEED, IT HAS A FANTASTIC DESIGN WITH A BRILLIANT USE OF COLOURS. Mon – Sat 10 am – 6 pm. AGE IN YEARS. TYPE: handknotted, wool pile with wool warp & weft. AGE: modern SIZE: 2.43m x 1.70m - 8ft. A sumptuous deep pile Moroccan carpet in a free and open contemporary design. CONDITION: good condition, full pile. A beautiful Frontier Ziegler carpet, featuring a bold floral pattern on a ivory field. TYPE: handknotted, wool pile with cotton warp & weft. AGE: Modern. SIZE: 3.09m x 2.45m - 10ft.1" x 8ft. THE RUG ATTIC. Persian hand-knotted rug made in the village of Nahavand which is around the Hamadan area, famous for its beautiful variety of village rugs. This is an area rug with a lovely combination of colours and motifs. 2.6 x 10 foot forest green high quality oriental hand-woven, handmade rug. 5' x 8' Top Quality Oushak design handmade oriental rug. grey, beige, cream.